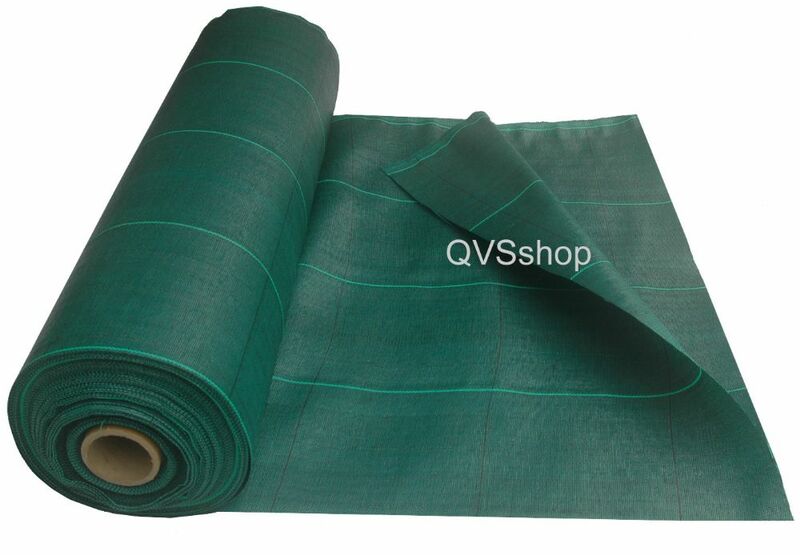 ​This 125GSM Extra Heavy Duty Green Weed Control Fabric is manufactured EXCLUSIVELY for QVS Marketing. 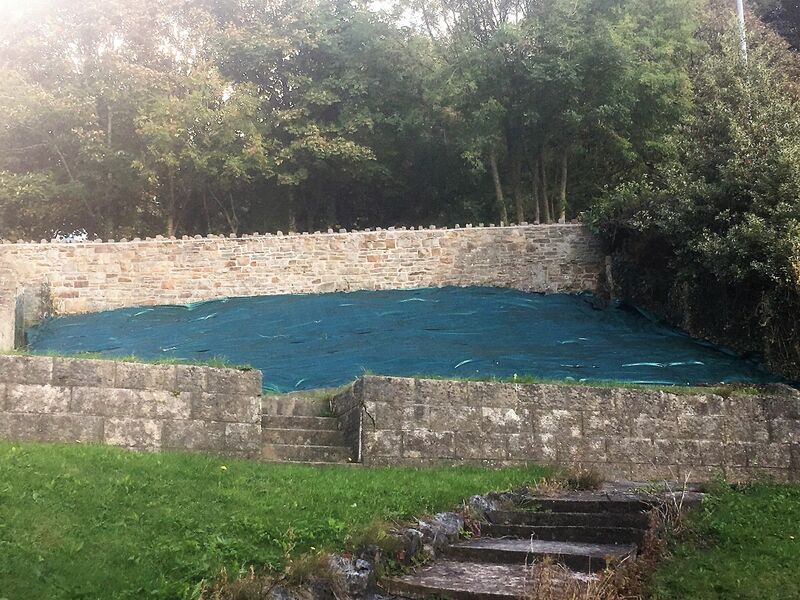 Green heavy duty weed suppressant membrane is not often found in the UK, not only are we able to supply it, but we have it in the superior woven heavy duty sheet. Its closely woven strips of polypropylene are UV stabilised and treated for an extra-long life. Green is a colour often preferred by gardeners because it is a more aesthetically pleasing alternative to the standard black sheeting you often find. Being extra heavy duty weed fabric, it is designed for uses such as driveways, paths, under lawns, flower beds, borders and can be even left uncovered to clear large areas of weeds. Purchasing a premium heavy duty weed suppressant membrane such as this, rather than an economy fabric, has many further benefits like more effective weed suppression and an extended life. The heavy duty weed control membrane fabric is incredibly simple to use, it is as easy as cutting the sheet to size with scissors and then laying it down. It is normal that multiple sections of sheeting are used during installation; when using multiple pieces an overlap of 20cm is sufficient. This suppressant is suitable for use with our range of weed fabric pegs; we recommend plastic pegs for soft ground and metal pegs for harder or rockier ground. 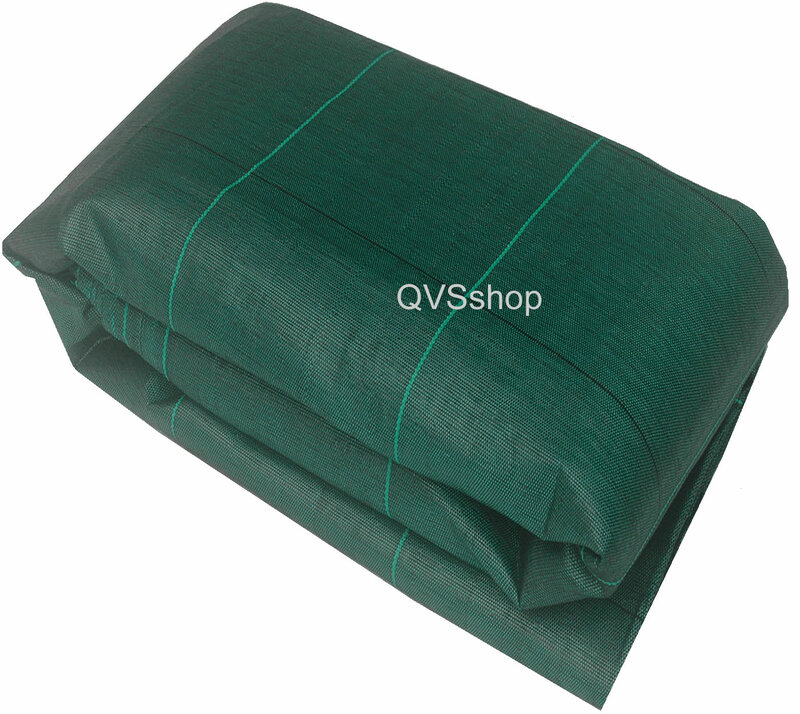 This green weed fabric performs a number of jobs, the first being that of stopping weeds growing from below the sheeting by preventing light from penetrating it. The suppressant keeps the soil below rich by allowing the through-flow of water and nutrients, meaning the ground will remain nourished and fresh for future planting. The sheet can also help with ground stability and is often used in the fight against soil erosion. Note - 3M, 4M and 5M rolls are ineligible for next day delivery. There are options to add pegs to your order here. The choices you have are 15cm long plastic anchor pegs and metal staple pegs. 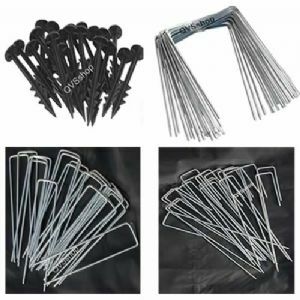 The heavy duty plastic pegs are for soft to medium ground; they are barbed for extra grip. The steel staples are 10cm (4") wide, 16cm (6") long and 2.9mm in diameter and designed for harder and stony ground. Extra heavy duty galvinised steel pegs are also available: Long Leg Pegs - 300mm x 45mm x 100mm (11.8" x 1.3" x 4") that are 4mm in diameter & U-Shaped pegs - 200mm x 45mm x 200mm (7.8" x 1.3" x 7.8") also 4mm in diameter. Please click here for our range of Weed Fabric Pegs. Good material, used as weed-suppressant, it is easy to lay and so far seems better quality than others used, which have torn easily. Packaging and delivery excellent. This product was excellent quality. Good to be able to buy a small quantity (2x5 metres). Arrived promptly. Good value. Would certainly use again. Fantastic product and fantastic after sales service. Highly recommended. Excellent heavy duty weed control cloth. Significantly superior to 100gsm cloth I have bought before from another source. The weed control fabric is superior and longer lasting, ideal to cover parts of allotment grounds which will be out of use during winter. I re-ordered this product as I was very impressed with the excellent quality and service received from my first order. Stronger and of much better quality than similar items purchased from other sellers in the past, this product is ideal for use on allotments. Will purchase this item again from QVS. We bought this to go under the slate in our front garden. It arrived promptly and was well packaged. The fabric is thick and strong and went down easily. Really happy with this product and would highly recommend. Ideal for what I needed it for. Quick service and speedy delivery. Customer service was brilliant, product itself is good quality and exactly as I wanted. Arrived the next day and well packaged! Would use again. Excellent product, Effective in weed control and a good base for gravel . Excellent product and the speediest delivery I have ever had for an online purchase. The order arrived extremely fast. Found the product to be very good quality and value for money. Would highly recommend. Good friendly efficient service, goods arrived very quickly and perfect for the job it was intended for. I would certainly recommend this company. Superb weed control fabric which we have used to create gravel paths and form barrier to area where we will be erecting a fruit and veg cage - strong, great quality and I love the colour green! We are buying more next week. I have bought the cheap black weed suppressor previously but was never convinced it was doing the job. This green weed suppressor looks the part and I am confident it will be as good as it looks.